The pesticides that farmers use to protect their crops have changed a great deal over the last few decades. While improvement is something we expect from technologies as diverse as pharmaceuticals to electronics, few people are aware of the positive developments in the chemicals used for crop protection. Dramatic change began with the establishment of the EPA in 1970 which led to the elimination of many problematic, old pesticides. Also, there has been a steady stream of new product introductions with both safety and efficacy advantages. To document how pesticides have changed, I decided to download historical information for one of my favorite crops - premium wine grapes. California has had mandatory pesticide use-reporting in place since 1990. The resulting data can provide a window on at least 22 years of this evolution. 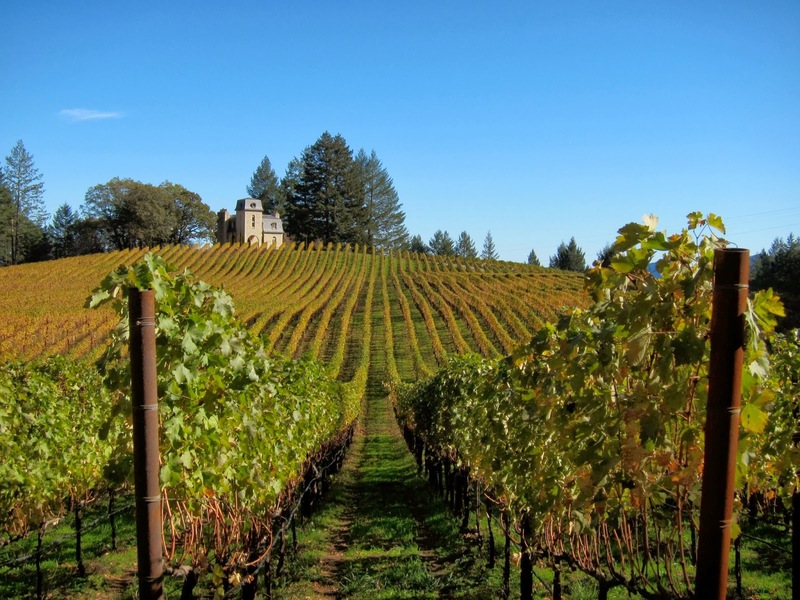 I chose 5 counties that would represent much of the premium acreage in both the North Coast (Napa, Sonoma, Mendocino - 121,700 acres in 2011) and the Central Coast (Monterey, Santa Barbara - 62,288 acres in 2011). Grapes have a wide range of pests, including several kinds of insects, mites, nematodes, fungal diseases, and viruses, the vectors of which require control. Weeds are also an issue. Because traditional varieties are highly valued, conventional plant breeding is not an alternative to get around these pest problems. As with other crops, the management of these pests involves much more than just pesticides. Even so, pesticides will always be necessary tools. Pest control in grapes is important for both yield and quality, and in some cases for the long-term survival of plantings that are very expensive to establish. 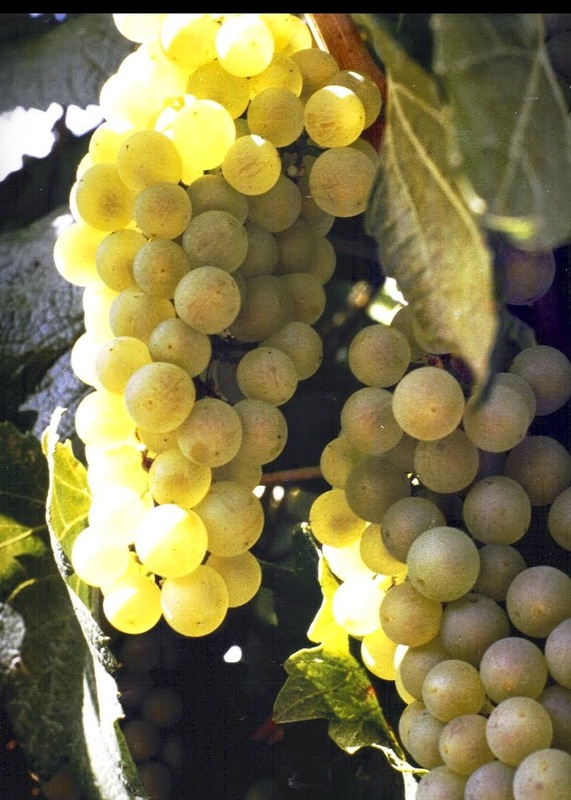 As with other crops, control of grape pests also preserves efficient use of other resources such as uniquely suitable land and scarce water, as well as expensive nutrients, fuel and labor. Fortunately, for reasons I will describe in a subsequent post, the pesticides available to farmers today are both effective and relatively safe - much safer than what they were a few decades ago, and much safer than most people imagine. 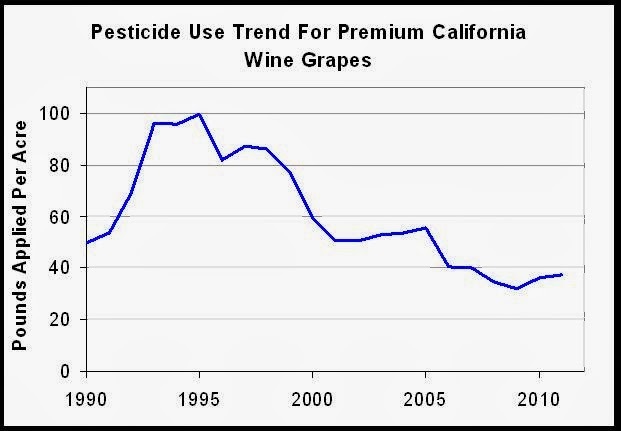 As you can see in the graph above, overall, pesticide use on grapes (in terms of pounds of active ingredient) has been declining since 1995. The numbers; however, are rather large compared to other crops - 40 to 100 pounds of active ingredient per acre per year (The recent controversy about pesticide use on Maize nurseries in Kauai was over a 1.9 lb/acre/year use pattern). There is one simple reason that these numbers are so large - sulfur. There is a fungal disease called Grape Powdery Mildew which infects even under California's dry summer conditions. Elemental sulfur, applied either as a dust or as a wettable spray, has been the mainstay for control of that disease for centuries. 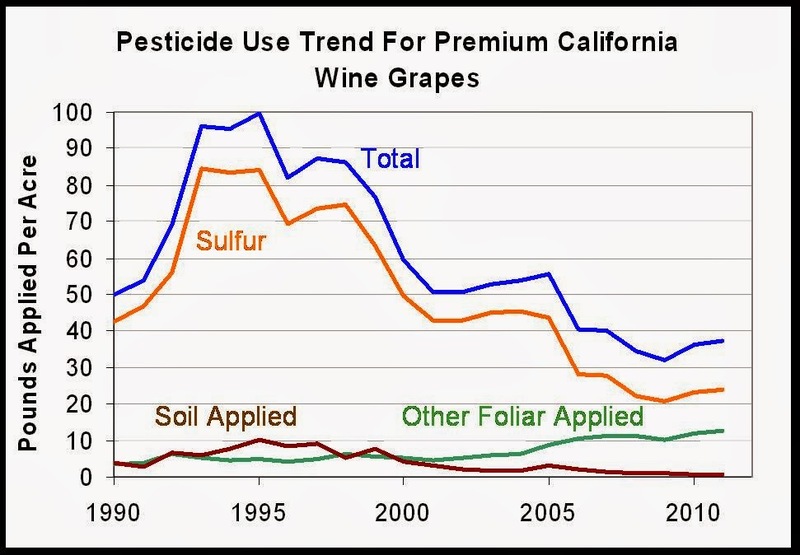 As you can see in the graph to the right, sulfur accounts for most of the very high pesticide load, particularly in the 90s. Sulfur is considered a "natural product" and is thus approved for organic. In fact it is almost all that an organic grower can use for this disease. It has to be applied frequently and at very high rates. Sulfur is considered relatively safe, but it is a skin and eye irritant which is problematic for vineyard workers. I've spent lots of time working in vineyards and the sulfur makes that unpleasant. The tendency of the dust to drift is annoying for neighbors of vineyards. 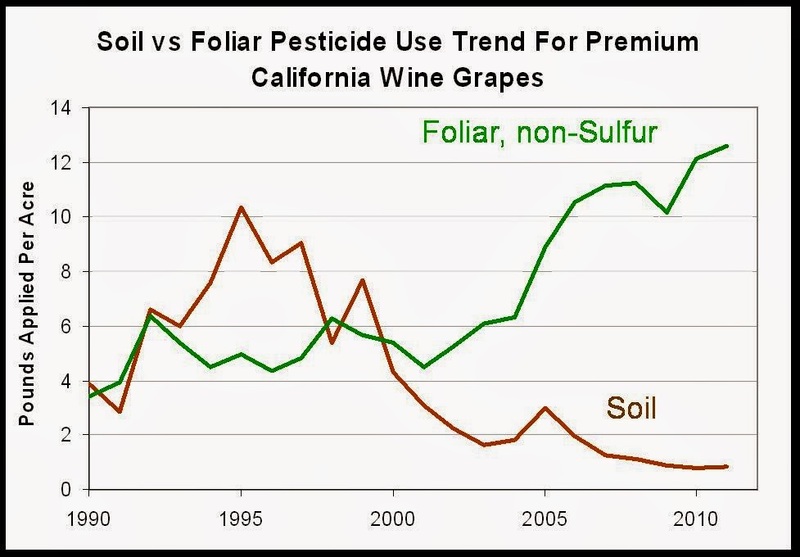 Notice that after 2000, the amount of "other foliar applied" pesticide increases. Much of this represents modern options for mildew control that have allowed growers to dramatically reduce their overall use of sulfur. Taking a closer look at everything that wasn't sulfur, we see that the pounds per acre of other foliar pesticides more than doubled and the soil-applied pounds per acre dropped 4x between 2000 and 2011 (the latest year of data available). But of course when it comes to pesticides, "pounds" isn't really a very informative measure. Pesticides differ dramatically from one another, particularly with regard to acute toxicity. What About Most People's Image of Pesticides? When most people hear "pesticide" their mental image is something like the old, highly toxic, organophosphate (OP) insecticides. The graph at the right looks specifically at what percent of all the pesticide applications (sprays, not pounds) were made with these sorts of products. Note that the classic, Category I OPs were never more than 6% of the sprays and have been under 1% for the last 10 years of data. Even the moderately toxic category II OPs have never represented much of the total spray load. In the last few years they have declined to an all time low. These products make up an even smaller fraction of the total pounds of pesticides applied (under one percent for all 22 years). Thus, what most people imagine when they hear "pesticide" is actually a very rare type of product in terms of actual use. 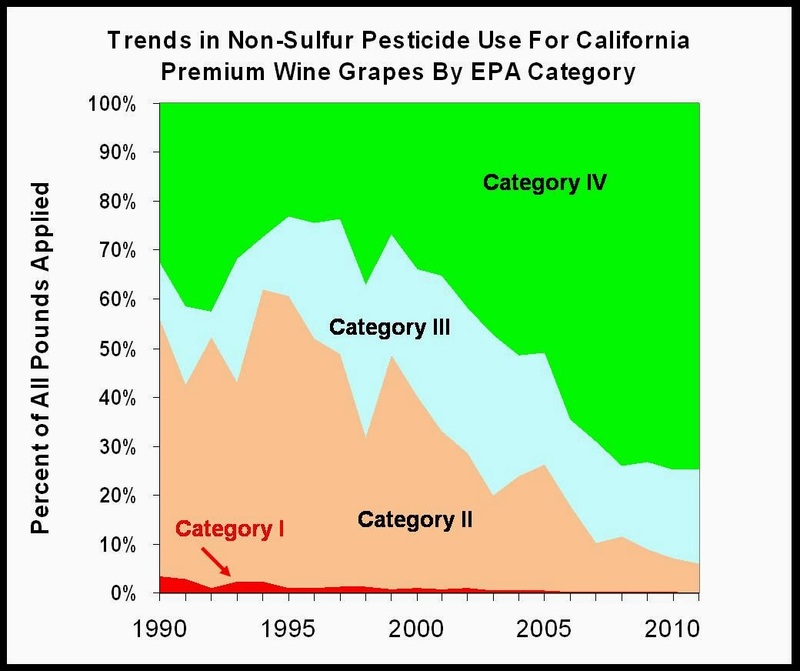 The graph above tracks the proportion of non-sulfur pesticides used on these grapes by EPA category. 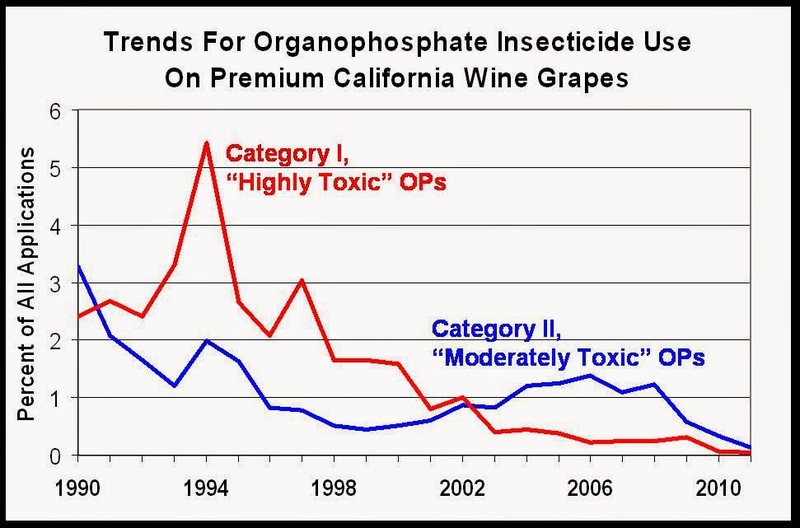 Even when all the Category I pesticides are included, they have never made up more than a tiny percentage of what is sprayed on grapes. If we had data like this going back to the 60s or 70s there might have been more - but highly toxic products have not been used much in this or most other crops for a long time. 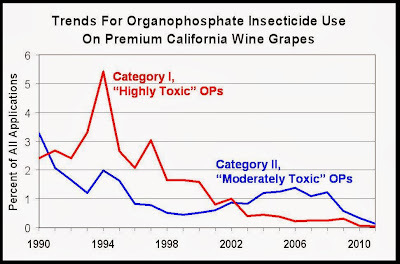 Category II pesticides were a reasonably good part of the mix until recently. The EPA calls these "Moderately Toxic." That may sound scary, but many familiar food and beverage chemicals fall into this toxicity range including capsaicin in hot peppers (140mg/kg) and caffeine in coffee (161mg/kg). Several products used on organic grapes also fall into this category. Even so, this has been a declining category over time. The EPA category III products are called "slightly toxic." Very familiar natural products like citric acid, acetic acid, vanillin or even table salt fall in this range. There has been some increase in the use of products in this category. The category IV products are classified as "practically non-toxic" and this has been the area of most rapid growth since the mid 1990s. Many of the products that have displaced sulfur use fall into this category. Many of the products that have replaced the old OPs fall into this category. These relatively benign materials are really the face of modern pesticides - not what most people imagine. The category II, III and IV products include a mix of synthetic products and natural products which could qualify for organic. The total area of organic grapes is small, but in this and other crops there is a substantial overlap between the pesticides used in conventional and organic. The EPA categories are rather broad, so another way to look at this is to "weight" the amounts based on their relative oral toxicity. In the graph to the right I have taken the foliar, non-sulfur numbers and multiplied them all by the value 500/Oral ALD50. 500mg/kg is the dividing line between "slightly" and "moderately" toxic in the EPA categories. Thus a product with a toxicity of 4000 mg/kg is counted as 1/8th of its weight in pounds. A product with a toxicity of 40mg/kg is counted as 12.5 times its weight in pounds. 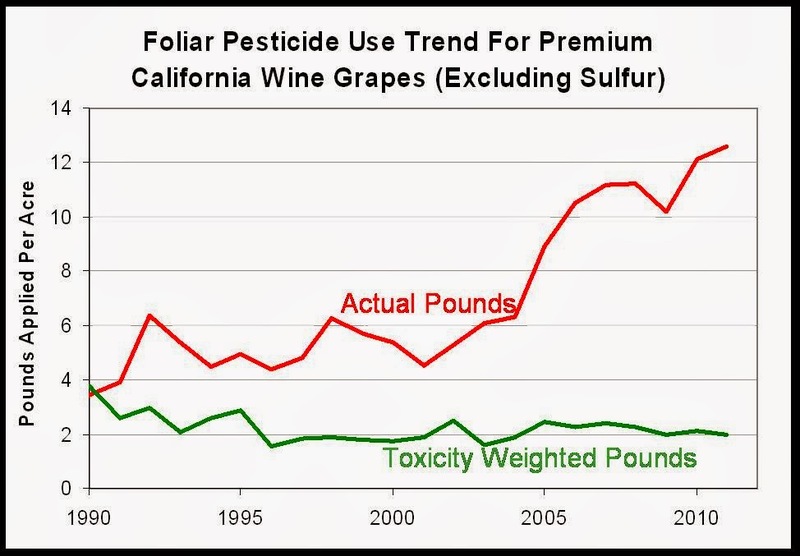 From this approach we see that even though almost three times as many pounds of foliar applied, non-sulfur pesticides are being used on grapes in recent years, there has really been no increase in the overall "toxic load" involved. In the 22 years covered by this data set, there have been some dramatic changes in the nature of pesticides used. The crop and product in this case may be quite special (and delicious), but the trend is not unique to wine grapes. We would see a similar change in most crops. This sort of change didn't happen by accident. It represents a great deal of work by a diverse collection of players in the public and private sphere. I'll go into that in detail in the next post in this series. There are many dimensions of toxicity, but the most basic is how toxic something is when consumed. This is what would be of concern for pesticide residues. This is called Acute Oral Toxicity and it is determined by feeding different amounts of a chemical to a population of rats or mice. The dose relative to the animal's body weight that kills 50% of the subjects getting that dose is called the LD50. It is expressed as milligrams of chemical per kilogram of body weight. For these numbers the larger the value, the less toxic the compound. For reference, table salt has an oral ALD50 of 3,000 mg/kg. For a 120 pound (54 kg) person that would mean a toxic dose of 163 grams which is about 1/4 of a normal, 1 pound canister of salt. For that same person, the toxic dose of caffeine (oral ALD50 191 mg/kg) would be 10.4 grams - what one would get from 32 servings of nice coffee at Starbucks. In both cases, the salt or coffee would need to be consumed very quickly to achieve that dose. Some of the most toxic insecticides ever used had oral ALD50s in the range of 5-10 mg/kg. Most pesticides today have oral ALD50s of more than 5,000 mg/kg (Category IV) and are less toxic than table salt, vinegar, citric acid, vanillin and many other familiar food ingredients.